Austin luxury real estate located at Escavera at Flintrock Falls. Located in a private golf course community, the completed, move-in ready home is now priced at $998,780. Rarely does an opportunity come along that is this affordable and luxurious. Buyers will love the spacious, one-story floor plan that is large enough to accommodate any family’s needs. The Escavera home spans 3,905 square feet and offers buyers four bedrooms, 4.5 bathrooms and a three-car garage. The large, covered outdoor living space with golf course views and Guest Casita are perfect for entertaining overnight visitors. Exercise and golf enthusiasts alike will appreciate the prestigious Jack Nicklaus designed Flintrock Falls golf course that is the focal point of the community. 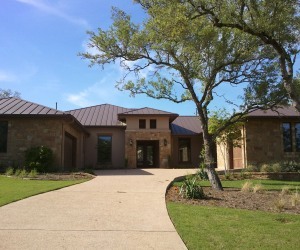 Austin home builders, buyers will appreciate Sterling Custom Homes’ craftsmanship and quality building.